Like most of the guys on my Midwest United FC team, I’m beginning to narrow my focus and strategically train to compete on a collegiate level following my senior year next year. 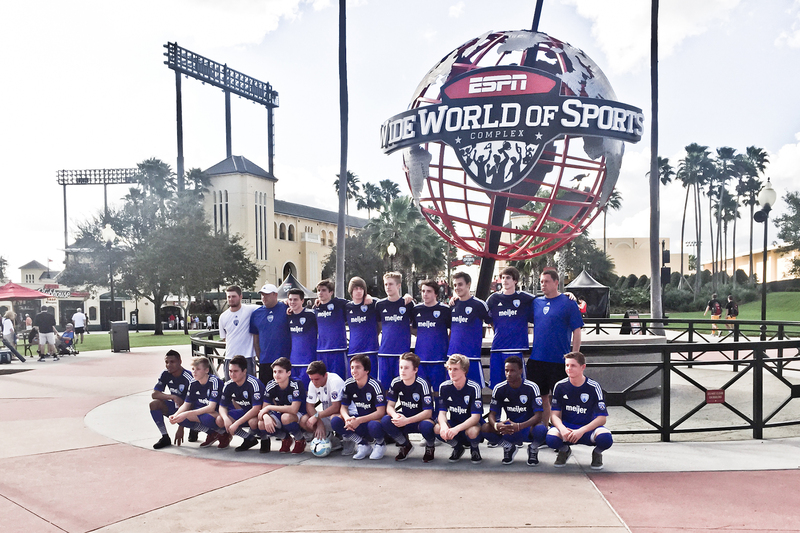 A couple of weeks ago, while most people were exchanging gifts, I spent Christmas in the car traveling to Orlando, Florida to compete at the Disney Soccer Showcase. University coaches and scouts came to watch some of the top teams and players in the nation compete. Disney had to be one of the coolest venues I’ve ever played at. The facility at ESPN World Wide Sports is incredible – soccer fields as far as the eye can see with grass cut to perfection. Just being there and walking the property the day before the tournament was astounding. We arrived on Saturday night and one of my first stops was the registration office in the Hilton Hotel on Disney’s campus. Let me tell you, that’s a crazy hotel. The swimming pool was ridiculous and about the size of a fairway. I went to the gathering area to meet up with the tournament director, Mark Luster and chat about Charity Ball. Mark is an awesome guy. I gave him an update and set his team up with several copies of the Charity Ball “Pass The Ball” Book along with some new decals. Afterwards, our family hopped in the car and headed to our hotel to call it a night. The next morning was an early one. Our first game was at 8:30am, but I had to wake up at 6 to eat, get ready, and be there on time. Even though it’s a struggle waking up early, I love morning games. The dew on the grass that morning helped create the perfect conditions for an intense game. We got the lead early off a breakaway by Jalin who tucked the ball into the back of the net. Our next goal didn’t come until the second half after another breakaway by J who notched it into the right upper 90 – leaving the keeper with no chance. The other team eventually got a goal, but it was nothing more than consolation after Alex added one on late to make it 3-1 for the final score. The rest of the day was basically hydrate, hydrate, hydrate plus protein and more protein. Game 2 was the next day at 4:30pm against De La Sol. The game stated while the sun was still up, and ended under the lights. It was a tough contest. De La Sol got a nice goal about halfway through the first half and we had to fight our way back. We had a few chances in the first half but were unable to capitalize. It wasn’t until the 80th minute that we were able to score through a nice ball from my buddy Kev into Mo who hit it off the volley into the bottom corner. The game ended as a 1-1draw. Game 3 was a must-win. It was in the middle of the day and extremely hot. We started out a little slow, but kicked it into gear towards the last few minutes of the second half. The ball popped to the outside and we were able to get a cross in that Cam who placed it neatly in the left corner. Sam added another one before the half but so did the other team which made it 2-1 at break. At this point we looked over to the field across the sidewalk and saw that De La Sol was losing so all we had to do was hold on for the win. Although it was tough, that’s exactly what we did and made it to the championship. It was the final day.10:45 kick-off against Sporting FC. It wasn’t our best performance. We weren’t playing as strong as we had the past few games and Sporting capitalized on a mistake and took a 1-0 lead. Despite the few chances that we had, we were unable to hit back before halftime. Our coach gave us a good talk at the half and we built off of that and used it as motivation to get after it. Then, after 25 minutes we finally got one back. A bouncing ball came to me in midfield. I saw Sam making a run towards goal so I lobbed it up off of the half-volley over the defender and in his path towards goal. He ran onto it, played it across the frame of the goal and J knocked it in. The rest of the 90 minutes was uneventful and overtime was necessary. Two 5-minute periods weren’t enough to decide the contest so penalties were next. After a series of strong PKs, our team was the first to miss. The next man for Sporting nailed his kick and won them the game. It’s always a bummer to lose in penalties, especially the final, but that’s soccer. I’ve had the privilege to play in some very cool tournaments – South Africa, Nike, ODP Nationals etc. But I’ve got to say – Disney was one of the best.